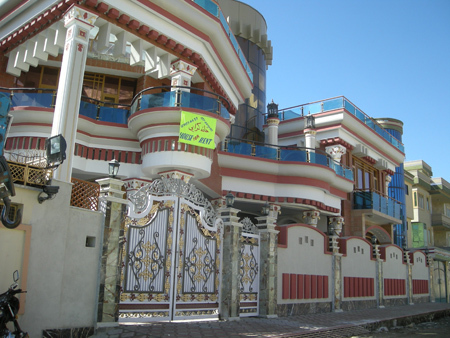 …or more properly, Koche Morgha, which runs off Turabaz Khan Sq, in downtown Kabul. On Chicken Street there are about 40 carpet stores, together with about 100 antiques, clothing, and furniture stores. Most of the wares in this street are modern reproductions, and the same applies to most of the war rugs. Whereas “old!” is the catch-cry of the dealers, one of whom protested that his tank-pattern war carpet was “35 years old”, to which I asked “before the war?”, “Yes!” he said. I visited every rug store. Only two of about 20 war carpets I saw (not counting the myriad S11, Defeat of the Soviets and Tora Bora “mats”) showed any signs of age or usage. When you comment on this, they say “Ah! But it’s so precious it’s been put away in the carpet store!”, or, “This kind of rug has been hung on the wall”. At least their age hasn’t been accelerated, yet. The most common type was the tank and armaments patterns typical of the Zikini (a.k.a Zakini, Zaikini, Zukini) people from around Farah, south of Herat. From two years old to ten years old, would be my guess. However the dealers’ attributions of this style of carpet were vague and various, from just “Herat” and when pressed, from Ghor to Badghis, to Farah provinces. My guess is that the dealers of Herat were the source of this style of carpet, but that the actual origins are quickly forgotten. I saw two Minaret of Jam rugs, with helicopters in the sky, and a larger 6×10 slightly worn rug with what looked like motor yachts, and UMOs (Unidentified Mechanical Objects). The newer simplified reproductions are more common, and the multitude of Defeat of the Soviet and S11 mats (produced in who knows what circumstances at Shebrghan to the north) are clearly still in multiple reproduction. These pictures show such mats in the process of being cut apart (multiples produced on continuous cotton warp) and having their fringes trimmed. “Who buys them?” I asked. “ISAF personnel” was the answer. But you don’t see ISAF people hanging out in Chicken Street, or elsewhere in the city, since the frequency of suicide bombings is on the increase in Kabul, and military personnel are the prime targets. So I went with a “fixer” Mohammed Hashim, a medical student, and on the advice of a press security officer, we didn’t hang about. Kabul is not a happy place. Here’s the war rug we found in the shop of Mohammed Omar (that’s Mr. not Mullah) in Herat (see previous post). As you can see, it’s a cityscape/landscape, derived from the Salang Pass carpets of the second generation. It’s made of poor materials, wool on wool, loose weave, scraggy pile, and has had a hard life. And it needs to have a few more washes – any suggestions how to get rid of the animal odour? Here’s evidence of a war rug discovered in use in Afghanistan. Mr Mohammad Omar is a textile seller on Sarak-t-Darb Iraq street in Herat, who had this war rug serving as a door mat at the entrance of his shop. Mr Omar bought it from “village people who were selling their carpets door to door”. It’s worn, and damaged, and extremely dirty, and clearly is not regarded as being of any great value. It may well be that such rugs were once made for sale, at the lower end of the market, and when they didn’t sell, they eventually found a use in such prosaic circumstances. Nobody I have asked knows of any in use in domestic situations. Readers will remember our previous speculations about the identity of the many arched bridge war rugs. We wondered how rug makers might find images of Sydney harbour… well here I am in a take-away outside the Mashhad bus station. If here, why not just across the border? Actually our three days combing the Tehran Carpet Bazaar uncovered only one war rug ( a fine Ali Khojeh style runner) which we weren’t allowed to photograph. But the ambience is something else… All roads point to Mashhad.